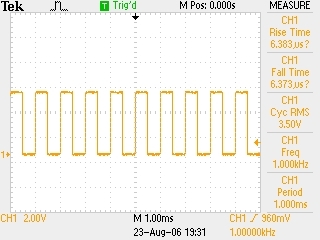 Electronics FAQ: Square Wave: Zooming in! Oscilloscopes are fun. And I like collecting stuff. So inevitably this led me to start collecting "waveforms" of common signals propagating in and between the various electronic equipment that run our lives. 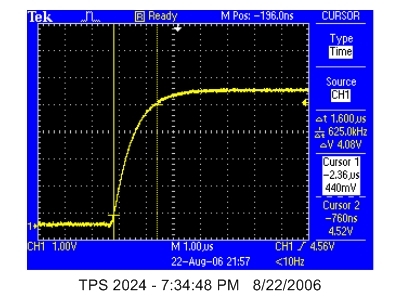 First up is a simple square wave captured on a Tektronix TPS2024 oscilloscope. 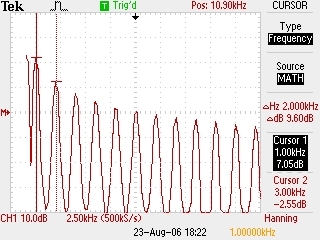 The square wave is taken from the oscilloscope itself and is actually meant for probe calibration/compensation. The square wave is 1KHz 5volt peak to peak. The animated GIF file below shows the square wave at each step as the time division knob is moved . I always wanted to make such an animation - sort of satisfies our inherent kiddish desires to play with knobs and buttons and move them/bang on them randomly madly!